Originally published under the title "Coup Lessons." Exiled Turkish preacher Fethullah Gülen (left) and President Recep Tayyip Erdoğan, once allies, have turned on each other with a vengeance. Every piece of evidence emerging after the failed putsch on July 15 indicates that President Recep Tayyip Erdoğan was the victim of a failed Gülenist coup d'état. But to get the picture right we must ask ourselves, perhaps ironically, what the victim and the perpetrator have in common. The answer is many years of staunch alliance and the same ideology: political Islam. Mr. Erdoğan now accuses the Gülenist movement of "having infiltrated into the state system over the past 40 years." He must accuse himself first. He was the man who paved the way for the Gülenist infiltration during the years he was in power, from 2002 to 2013, when he broke up with the "terrorist." In his own words: "Whatever you asked for, we gave it to you." In short, Mr. Erdoğan was a devoted Gülen ally during 37.5 years of the "terrorist's" 40-year quest to capture the Turkish state. What brought them together? 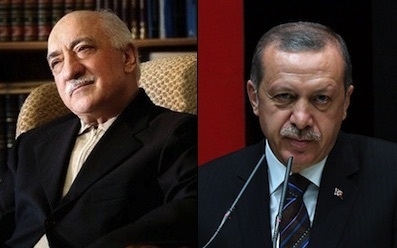 What, essentially, do Messrs. Erdoğan and Gülen have in common, ideologically speaking? The desire to Islamize. Did they break up because of deep ideological divergences? No. Over methodology in reaching a common goal? Perhaps. Because of greed for political power? Probably. But not because one of them decided to abandon political Islam. The failed Gülenist putsch offers lessons that Turkish Islamists will probably never learn: Islam the religion or Islamism the political ideology will never forge a wonder alliance or achieve your end goals just because Islamism the political ideology brings together a small or big bunch of like-minded conservative Muslims sharing an ideology that aims to "conquer" Muslim lands first (by imposing Islamism on secular Muslims) and then "conquer" infidel lands (by imposing Islamism on non-Muslim nations). Turkey experienced a coup attempt by Islamists disguised as officers against Islamists who are not disguised. "Conservatism as a glue" and "he is a good fellow who prays five times a day, has his wedding ring on his right hand, has a particular type of moustache" are foolish indicators upon which to forge enduring political alliances. Being conservative Muslims isn't enough to make a strong bond. If President Erdoğan's narrative of the July 15 coup attempt is right, what we see here is basically a coup attempt by Islamists disguised as officers against Islamists who are not disguised. In short, an Islamist coup against an Islamist government. Will the Turkish Islamists in power ever understand that piety or non-piety is not a good basis to establish friends from foes? No. For several years they feared a putsch from their ideological nemesis, the secularists. In a bitter irony, the secular officers helped them suppress the Islamist coup attempt within the army ranks. The Islamists in power must now purge tens of thousands of Islamist government officials, including senior judges, military and police officers, academics, and their former allies. They must close down thousands of Islamist schools, NGOs, and foundations and engage in a witch-hunt in a country ruled under a state of emergency; Islamists running after Islamists. Funny, more women with the Islamic headscarf are now being arrested than under the oppressive secularist regime of the late 1990s. Sadly, the Erdoğanist-Gülenist (political) amorous affair produced millions of pages of (political) love letters (just Google it and see material as recent as even 2013) but ended up in the courtroom after domestic violence. Now there will be new Islamist-to-Islamist alliances, with new sects competing to emerge, just because the pious can only trust the pious. And then the headlines on another dreadful day will be bad déjà vu. A minor note to my former "sparring partner," column neighbor Mustafa Akyol, who wrote that "the government is trying to wipe out a cult that has secretly infiltrated the state, in order to impose its own agenda by using every dirty method against its enemies." That is wrong. The government is trying to wipe out a cult that has not-so-secretly infiltrated the state as its best ally in order to advance a common ideological goal, and by using every dirty method against their then-common enemies.